Can you feel it? The holiday spirit is trying to burst through your doors and enter your homes by leaps and bounds! Let’s give it a warm welcome by combing through a bunch of these amazing holiday favorites for home decor at Christmas! There are decor items to make, things to create as gifts, and even projects you can incorporate your children or grandchildren into making with you. Have fun! I hope you enjoyed this collection of easy and beautiful Christmas decor ideas! With so many great ideas to choose from, you’re sure to have a very, merry Christmas crafts/projects season this year and a positively festive home! Please share with me in the comments which ones you found as the easiest to make or those that had the best final outcome as far as presentation. I can’t wait to hear about your crafting adventures! I really love the wall signs. I may try my hand at one before the season is over. They’re really nice. Thank you for sharing these 20 beautiful Christmas decor ideas. If ever you have a list of presents this coming holiday, may I suggest you can check Kidioke. Perfect as holiday gift this season! These are all such great ideas. I love home decor that I can make myself. Ooh I love them all! I collect Christmas stuff so I would love to have everything here. This year we will be decorating differently because there is a toddler in the house and we have to child proof everything. I will look through your suggestions and maybe find one or two that would work with our situation. Some really great tips! I love easy decor. I rely on it for my chirstmas decorating and this is all really great. I have been looking for holiday craft ideas. Need to bookmark these for sure. I absolutely love holiday decor and your ideas are wonderful! I especially love the angel christmas tree decoration! I love that these are so easy to make. So often I see a project and get overwhelmed by all the steps and pieces that we need. These are all great ideas on decor to make, I am thinking that I will have to make my own wreath this year! Curious how it will come out! I love DIY crafts. These are all great. I will have to make a wreath for my door this week. This is quite a comprehensive list! I am sure this will be of use to many people seeking some help. These sound easy to make and really cool! 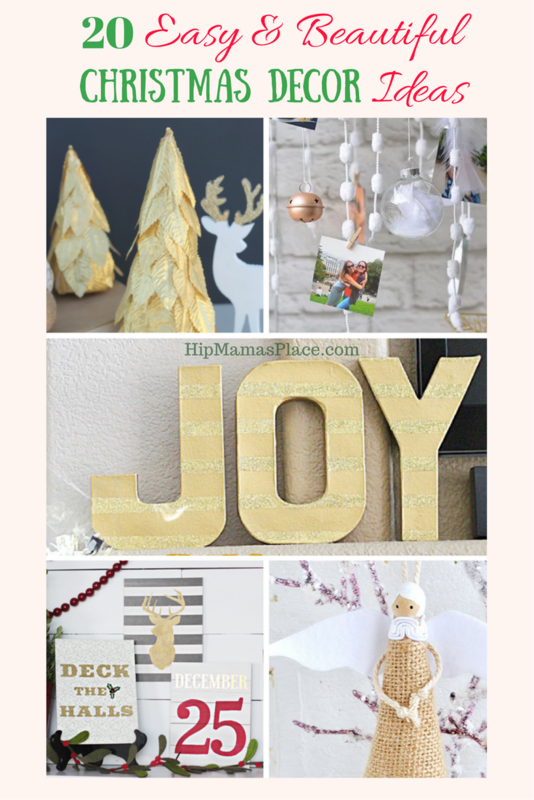 I love DIY decorations for Christmas and I can’t wait to try some of these. Thanks for sharing! Your christmas decoration ideas are great.. Very unique and creative. I would love to try to make some of your great ideas. I love your christmas decoration ideas.. Looks so simple but elegant.. Thanks for sharing this. We are only halfway done with decorating here. I am looking forward to the kids having time off of school so we can craft and bake! I love Christmas decorations, and i love DIY’s. I would love to try a couple of these, especially the wreaths. Easy and Beautiful? Count me in. mY Favorite is the joy scrabble tile decorations. Goodness, I just love so many of these wonderful holiday decor ideas! I think those wood veneer ornaments are first on my list. I love the Scrabble tile idea! Goodness knows we have more than one partial game around here. Might as well turn that clutter into Christmas decor. These are beautiful. I like the shadowbox idea. What a great round up! I have been looking for some DIY holiday decor ideas for my next girls night crafting! I’ll pin this post for later. Thanks so much for sharing these ideas. I wanted to do some new things this year with my decorating, but I didn’t know what I could do. These are great ideas. I love how easy they are to make and how lovely they look. That’s the best combo.